Grenham Travel, Sunway and Ireland West Airport have teamed up to give you the opportunity to win a fantastic prize for one adult and one child to visit Santa in Lapland for December, 2018. A fairytale world of snow covered forests and the opportunity to meet Santa himself is what makes a holiday to Lapland the perfect choice for treasured memories. Lapland has the last remaining expanse of wilderness in northern Europe, including the coastline, forests, mountains and unspoilt rivers, and in winter this becomes a wonderland of snow where you can experience the fun of snow mobiles, toboggans and sleigh rides. From the moment you arrive in the snow clad magical world of Lapland, your time is filled with things that dreams are made of. Lapland trips start at the airport, where the day begins with an early morning flight. On arrival at Rovaniemi airport - the official airport of Santa Claus - you will be met by elves who will guide you throughout your stay and help you search for Santa. On arrival, you are kitted out with arctic clothing including arctic suits and snow boots which you will wear for most of your time there. Depending on your chosen package, you will take part in a host of fantastic activities, such as a snowmobile adventure, a reindeer sleigh ride through a snowy forest, a husky dog ride, decorating gingerbread, fun in the snow, and of course meeting Santa Claus himself and getting to see his village and post office. During the day, you will take a break from the activities and recharge your batteries by enjoying a nice hot lunch in a cosy restaurant. After a long day, you will return to the hotel where you can relax and unwind and enjoy a three course buffet dinner. Do not forget the snow covered town of Rovaniemi is on your doorstep, for those eager to explore. Visit Santa Claus village, located on the Arctic Circle, and enjoy a private meeting with Santa. Make friends with the cheerful postal elves in Santa’s Post Office. 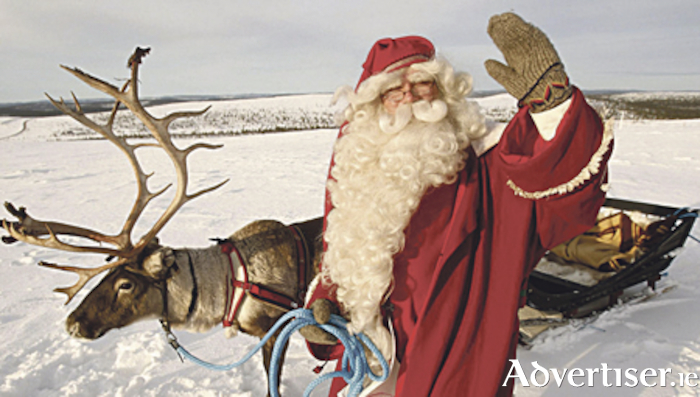 A trip to Lapland will create memories for you and your children that will last a lifetime. Prices start €899 per adult and €799 per child and include flights, 20kg bag, accommodation, food, arctic gear and activities. For more information call Grenham Travel on (090 ) 6492028 or visit their office at 1-3 Connaught Street, Athlone. To enter, visit Grenham Travel’s Facebook page, and like and share competition.